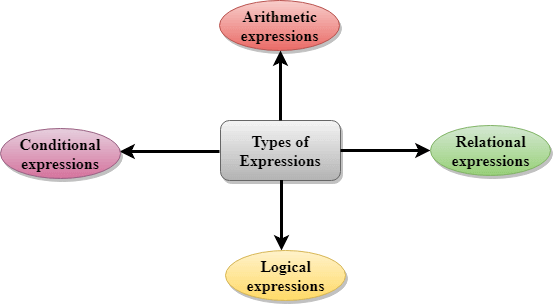 An expression is a formula in which operands are linked to each other by the use of operators to compute a value. An operand can be a function reference, a variable, an array element or a constant. In the above expression, minus character (-) is an operator, and a, and b are the two operands. Each type of expression takes certain types of operands and uses a specific set of operators. Evaluation of a particular expression produces a specific value. The entire above line is a statement, not an expression. The portion after the equal is an expression. An arithmetic expression is an expression that consists of operands and arithmetic operators. An arithmetic expression computes a value of type int, float or double. When an expression contains only integral operands, then it is known as pure integer expression when it contains only real operands, it is known as pure real expression, and when it contains both integral and real operands, it is known as mixed mode expression. The expressions are evaluated by performing one operation at a time. The precedence and associativity of operators decide the order of the evaluation of individual operations. When both the operands are of type integer, then arithmetic will be performed, and the result of the operation would be an integer value. For example, 3/2 will yield 1 not 1.5 as the fractional part is ignored. When both the operands are of type float, then arithmetic will be performed, and the result of the operation would be a real value. For example, 2.0/2.0 will yield 1.0, not 1. If one operand is of type integer and another operand is of type real, then the mixed arithmetic will be performed. In this case, the first operand is converted into a real operand, and then arithmetic is performed to produce the real value. For example, 6/2.0 will yield 3.0 as the first value of 6 is converted into 6.0 and then arithmetic is performed to produce 3.0. 6*2/( 2+1 * 2/3 +6) +8 * (8/4) An expression is given. 6*2/(2+2/3 + 6) + 8 * (8/4) 2 is multiplied by 1, giving value 2. 6*2/(2+0+6) + 8 * (8/4) 2 is divided by 3, giving value 0. 6*2/ 8+ 8 * (8/4) 2 is added to 6, giving value 8. 6*2/8 + 8 * 2 8 is divided by 4, giving value 2. 12/8 +8 * 2 6 is multiplied by 2, giving value 12. 1 + 8 * 2 12 is divided by 8, giving value 1. 1 + 16 8 is multiplied by 2, giving value 16. 17 1 is added to 16, giving value 17. A relational expression is an expression used to compare two operands. It is a condition which is used to decide whether the action should be taken or not. In relational expressions, a numeric value cannot be compared with the string value. The result of the relational expression can be either zero or non-zero value. Here, the zero value is equivalent to a false and non-zero value is equivalent to true. x%2 = = 0 This condition is used to check whether the x is an even number or not. The relational expression results in value 1 if x is an even number otherwise results in value 0.
a!=b It is used to check whether a is not equal to b. This relational expression results in 1 if a is not equal to b otherwise 0.
a+b = = x+y	 It is used to check whether the expression "a+b" is equal to the expression "x+y". a>=9 It is used to check whether the value of a is greater than or equal to 9. A logical expression is an expression that computes either a zero or non-zero value. It is a complex test condition to take a decision. Let's see some example of the logical expressions. 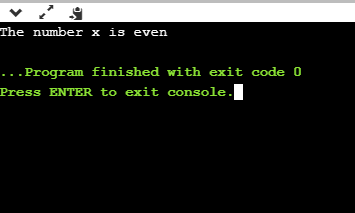 ( x > 4 ) && ( x < 6 ) It is a test condition to check whether the x is greater than 4 and x is less than 6. The result of the condition is true only when both the conditions are true. x > 10 || y <11 It is a test condition used to check whether x is greater than 10 or y is less than 11. The result of the test condition is true if either of the conditions holds true value.
! ( x > 10 ) && ( y = = 2 ) It is a test condition used to check whether x is not greater than 10 and y is equal to 2. The result of the condition is true if both the conditions are true. 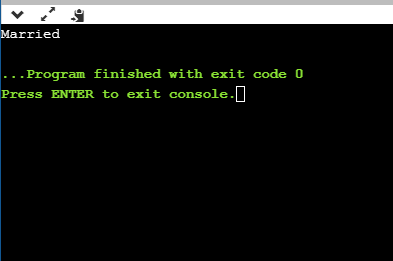 Let's see a simple program of "&&" operator. 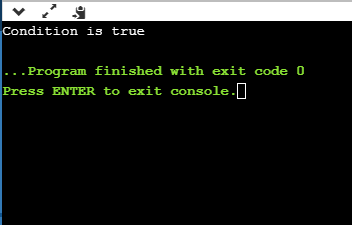 A conditional expression is an expression that returns 1 if the condition is true otherwise 0. A conditional operator is also known as a ternary operator. Suppose exp1, exp2 and exp3 are three expressions. The above expression is a conditional expression which is evaluated on the basis of the value of the exp1 expression. If the condition of the expression exp1 holds true, then the final conditional expression is represented by exp2 otherwise represented by exp3. Let's understand through a simple example.